The National Park Service at Mount Rushmore National Memorial offers academic internships in the Interpretive Branch to qualifying students in the fields of interpretation, communication, history, parks and recreation management, natural history, and related studies. Our interpretive internships allow students to fulfill a number of academic requirements while experiencing first-hand the interpretive operation of a major national park unit. This year is the 4th year of the Mount Rushmore History Association scholarship. We are offering 6 scholarship positions. Each position, will receive a $2,000 payment on or about week 6 of the Internship and another $2,000 at the end of a completed 13-16 week internship. This year’s internship season begins on 5/14/17. Interns work alongside Mount Rushmore staff in conducting guided walks, interpretive talks, roving patrols, and providing visitor services at information desks. After intensive orientation to the site and training in the role and practice of interpretation, interns develop their abilities in public speaking and visitor services through supervisory coaching and teaching provided by one of our three certified interpretive coaches. Previous student interns have benefited from such hands-on experience when seeking employment with the National Park Service, related agencies or organizations. Please view our video found here https://www.youtube.com/watch?v=oIyoCVjRDuA for more information The enclosed description of the internship program may be copied for interested applicants or posted on your department bulletin boards, as needed. The website source for information on Mount Rushmore National Memorial is Blaine_Kortemeyer. Looking for just the right candidate with a passion for wilderness, excellent communication skills and education/interpretation experience for this fabulous temporary job out of Stanley, ID working to protect the Sawtooth, White Clouds and Hemingway-Boulders Wilderness areas. If you know that person – send them my way! Position opens Friday. The Urbana Park District is now accepting applications for the Environmental Education Coordinator position at the Anita Purves Nature Center. This position is full-time, exempt, and benefit eligible. Urbana Park District has a vacancy for your consideration. Please find the details below. If you have any questions about the position, please contact Judy Miller at 217-384-4062. If you need assistance with the application process, please contact Andy Rousseau at 217-255-8601. Urbana Park District uses the AppliTrack system from Frontline Technologies to manage employment applications online. This position is posted as of today, February 10, 2015. If you interested in this position, please be sure to apply no later than March 9, 2015. This position is open to internal and external candidates. If you know someone else who may be interested, please pass this information along. I encourage all qualified applicants to apply. For more details and to apply, please visit http://www.urbanaparks.org/employment.html. The Urbana Park District only accepts online applications. The anticipated start date of this position is May 4, 2015. This position will be posted at Urbana Park District facilities that are open year-round until March 9, 2015 (Administration Office, APNC, UIAC, Planning and Operations, PRC, Brookens). If anyone has any questions or concerns, feel free to contact me. GoEco invites geography students and faculty to participate in our internships and volunteer projects abroad! Thank you and I hope you’re having a great day! Please distribute these seasonal job opportunities at Midewin National Tallgrass Prairie. This summer position provides an opportunity to work with a nationally recognized residential environmental education institute while living in Great Smoky Mountains National Park. Especially appropriate for someone who would like to gain entry-level experience in environmental education, teaching techniques, natural history and science skills. Qualifications: Energetic, enthusiastic, and committed individual interested in professional training and development in environmental education in a summer camp setting. College emphasis and training in environmental education, natural history, or related field preferred, plus experience working with children. Have the proven ability to work with people, can follow through on assignments, be detail-oriented, and have a valid drivers license with a good driving record. One year or more of college in a related degree required. Basic First Aid and Community CPR training preferred. Compensation: Housing, meals, uniform, and a stipend of $180/week. Dates of Employment: May 26–July 25, 2015. Application Deadline: February 13, 2015. This is a paid internship through National Great Rivers Research & Education Center (NGRREC) in Illinois. It is open to all interested qualified students. This intern will also be doing forest inventory here at Mingo NWR with the DFP intern and then will be working by themselves in the field or leading a small group to help collect data. There are also many other very interesting internship opportunities available through this program and encourage students to take a look and apply. The deadline for applications is Feb. 16 at www.ngrrec.org/internship. The information is on the flyer, which is attached. Hopefully the DFP information should be released this week or soon. Over 90 new jobs were added to EElinked and new jobs are posted every day! NAAEE is seeking a talented Administrative and Program Assistant to work in our DC office. Apply now! Environmental Education Internship: Chimp Haven Inc. The beautiful Sawtooth NF has seasonal positions available. Open now and some close as early as Jan. 20. Please share with those that might be interested. Please share with potential candidates who might like to work hard and play hard in beautiful Stanley, Idaho! Recreation technician, river ranger and trails positions are open now and there’s a short window for applications. Just to clarify, there is only one position. Hi Folk, Please see attached. Just opened today- Two temporary fire positions advertised for the IL. Interagency Dispatch Center, Murphysboro, IL. · GS-2151-04 Automotive Equipment Dispatch position. USAjobs Announcement # 15-TEMP0908-112860-DT-RK Open Jan. 13, 2015 to January 26th 2015. For additional information on either position, contact Molly Campbell at (618) 687-1725. Please pass them along to ensure a wide distribution. They have been posted to our website. If you are in contact with our recent or not-so-recent grads who need work, please show them this announcement from one of our alumni. While I’m at it, here is another really good outreach notice for students looking for entry level work. A lot of jobs in different resource areas, at numerous locations. I always stress to those applying that calling and making contact with the supervisor is essential. Hey Dr. Park, Here is a listing for an interpretation internship in the Georgia mountains for summer 2015. This is where I did my internship last summer and I loved it. Please pass along to your interp class or anyone you think may be interested. Good news, looks like American Conservation Experience (ACE) has posted some new jobs that you might be interested in. If you don’t know or remember your password, click here to reset it. If you’d like to unsubscribe and stop receiving these emails click here. I am not sure if SIU has an area students can go to look for scholarships, or if you are the right person to contact about this even. However, my company has a scholarship they award every year and not many people apply or even know about it, so I am trying to spread the word as last year it wasn’t awarded at all. The link for the scholarship is http://ilma-lakes.org/scholarshipgrant , I am not sure if they are still accepting applications, but like I said they offer it every year. Both of my brothers went to SIU (Joe and Tim Fleischauer), and since they have to be from an Illinois school to be awarded the scholarship, I figured I would try SIU. Anyone in the fields of geology, environmental science, restoration, ecology, biology, etc. would be eligible to apply to said scholarship. The link has all the details, but if you have any questions, please feel free to ask. I am most easily reached by e-mail as I am usually in the field and out of the office. I hope that this has reached the right person, and if not, I would appreciate if you could forward it to the respectful contact(s). The MinnAqua Program is hiring 7 Education Interns this year located in Bemidji, Duluth, Hutchinson, New Ulm, St. Paul (2) and Shakopee. The application deadline is January 30, 2015. This announcement may be of special interest to Native American students who are considering graduate school, as well as to other prospective graduate students with an interest in conducting research on Native American lands here in the Southwest. The areas of research will include fire ecology/forest modeling and ecosystem services. Merry Lea is hiring a Director of PreK-12 Environmental Education. More information may be found at the link below. 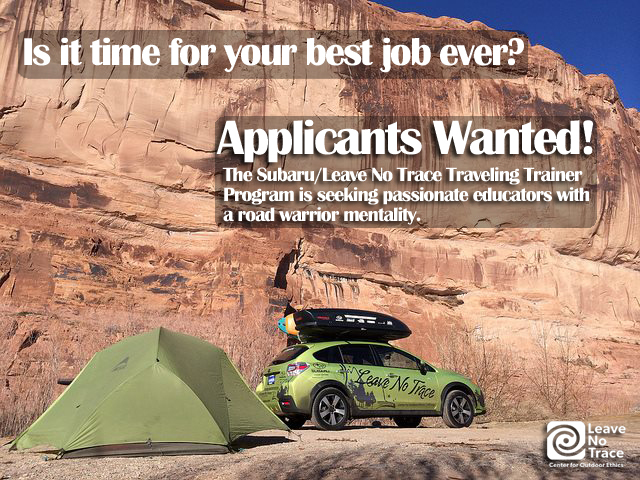 We have posted the Call for Applicants for our next Subaru/Leave No Trace Traveling Trainer Teams and we need to get this out to our connections to cast our net far and wide. Please share this with our partners, agency folks etc and if possible, ask them to share it on their social media outlets as well. I have also attached the pdf version of the job posting, as well as a photo from the posting that can be used, in case anyone wants it pulled out. Here is the link to the positions. If anyone has any question about the positions feel free to call or email me. These are intended to be training positions, to replace future vacancies in resource forester positions. Typically it takes 1- 3 years to move up to the resource forester level. It is a good opportunity to get your foot in the door in a professional position. Several former SIU grads have been successful in these positions in the past.